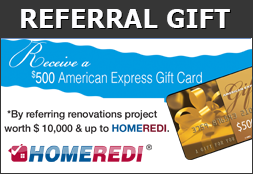 HOMEREDI Plumbing and Heating Services are provided as part of our Restoration and Renovation Services to Home Buyers, Home Sellers and Realtors through our multi-vendor partnerships with pre-screened Licensed and Insured Plumbing Contractors in Long Island. Every project regardless of its scope of work will be managed entirely by HOMEREDI qualified staff on a daily basis. Most common plumbing service changes we have seen in the past couple of years have been the conversion of Oil to Gas systems which enables you to substantially reduce your Total Cost of Ownership. A Gas service change also enables you to have a fully operational Hot Water Heater Systems during major power outages. Most homes built around 1950 in Long Island do not have Central Cooling and Heating Capabilities. HOMEREDI along with our strategic partners are able to bring the expertise and know-how needed to Design, Install and Maintain the most energy efficient Cooling and Heating systems available. Every system installed enables the Home Owner to remotely access the control panel for convenience and efficiency.